Through our UK dealer the question was asked whether Boere could built a machine for sanding of rubber. However, this was not just rubber, but rubber floor covering for underground trains in London. Rubber is a dfficult material being very flexible and as such, sanding costs a lot of energy because the material quickly curls around which results in a turning off machine. 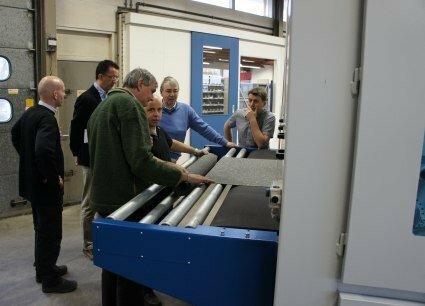 If worst, both the material ánd the machine can be damaged. The machine has been equipped with 2 contact roller units with which the 2 - 3 mm thick material is calibrated on the 1st contact roller while the 2nd contact roller provides for the fine finishing. Because of the material type both units will not be used simultaneously. Furthermore, operation takes place via a central operating panel on a swiveling arm, since the machine is very wide and operators need to operate the machine in an ergonomic way. As the machine quickly pollutes, inspection covers have been mounted so that cleaning can take place in time. 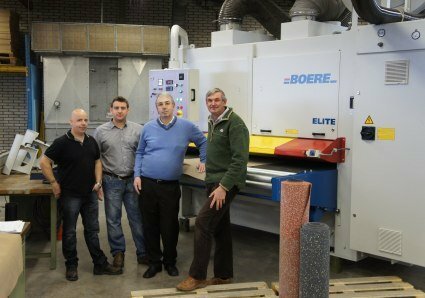 Last month Boere's customer accepted their wide custom-made machine for sanding rubber floor covering. A beautiful example of the many applications and sanding solutions Boere can deliver. Meanwhile the machine is working to full satisfaction in the UK.